When I draw with the brush, the end of the line is not as thin as the begin like how it works with Sketchbook pro or Procreate. Did you know how to make it work ? Can you give us a bit more information on what you're doing please? If you can record a screen video that would help a lot. However from what I can see is that you're using a Vector Brush which draws a vector line. Sketchbook Pro from what I can see using pixel based brushes so works off entirely different technology. Have you tried going into Pixel Persona and using the Paint Brush Tool with appropriate pressure settings? It will give you a result more comparable to Sketchbook Pro (as they both use pixel based brushes). i have the same problem. I was so confused. I havent figured out how to use the brush with strokes like your picture yet. I was able to use the pencil tool to achieve the same strokes though. Try the pencil tool. Adjust the pressure curve to look like an upside down U. 3pt stroke. No fill. No controller settings. (no pressure or velocity). Hello, I use the brush tool in pixel mode. In procreate and sketchbook pro, the end of the stroke is automaticaly thiner than the stroke. When we draw fast small line, it is very usefull. I make this vidéo, I hope it's more understanding ! I have the same problem. Can’t modify brushes like this. Hope AD team add something to do it. Choose the brush that you want to use, tap on the ‘More’ control on the Context toolbar and then tap on the ‘Dynamics’ button. Set the ‘Size’ slider to 100% and set the corresponding controller to ‘Velocity (Inverse)’. Tap ‘OK’ and then test with a few quick strokes: they should become thinner as your finger, stylus or Apple Pencil comes to a standstill at the end of the stroke. 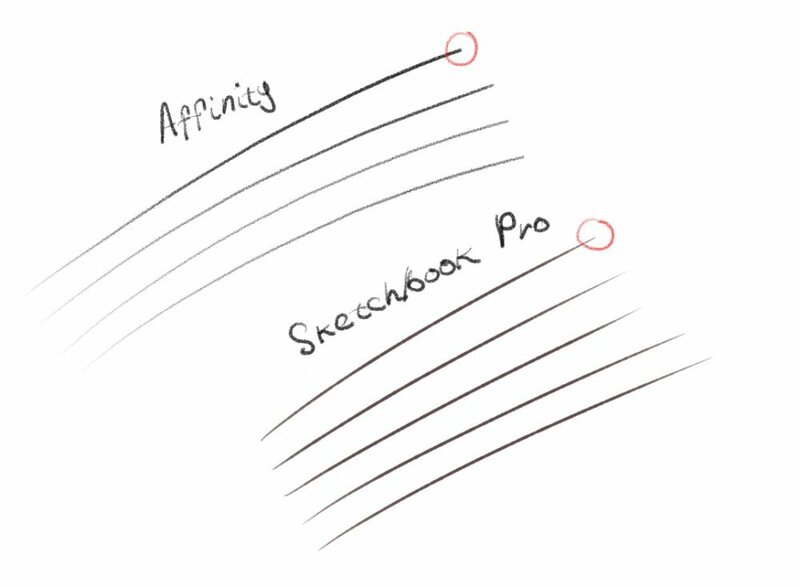 Hey guys, Unfortunately the end taper just isn't as strong as say ProCreate or Sketchbook, so it's not quite possible to get that level of taper in Affinity. I'll get it passed on to development! Thank you but it's not very usefull with this solution. Thank you, I hope it will come soon because I can't use Affinity without this. I draw comic book and It's an option essential for my work.